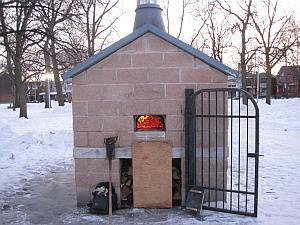 The oven stands between the playground and the pleasure skating rink at Alexandra Park. 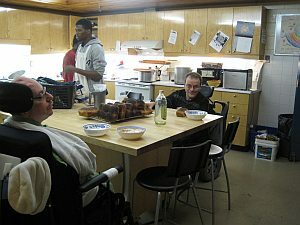 During the warm season, a cooking program at Scadding Court Community Centre uses it to bake pizza, bread, and muffins, and to roast or even dry vegetables. The program goes all year around, but Krista, who runs the program, doesn’t have enough hands for oven operation during the winter. We decided to take it for our oven tryout project. Baking with an outdoor oven is indeed a bit of work. In the wintertime, it feels like a little more. 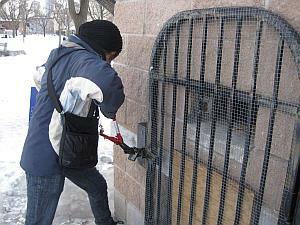 Our first action with this oven was to cut off the lock that was frozen solid. I had anticipated long hours of preheating because of the cold and the very small mouth of the oven, but with the help of wind, the fire went well. I must have looked strange in the rink change room though, sitting around with a rake (used to stir the fire) instead of a hockey stick. I was just about to close up after 3-4 hours of fire, when a passerby threw some more logs in the oven. Much as it ruined my lock-up plan, it is also a part of using an oven in public space. 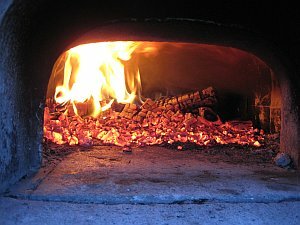 It’s hard to predict how an unfamiliar oven would behave or what odd (or natural) things people might do when they see a fire. The next day, Krista and I met at the centre at 9:30. The fire was lit at 10, and we each made dough. 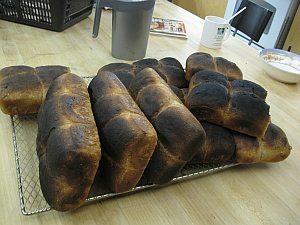 Krista’s was “Healthy White Bread” with wheat bran and lots of seeds, which was served at the café and other programs at the centre, and mine was Potato-Onion Buns that we make for Dufferin market. At 12:30, the program participants arrived and eight of us, including staff and volunteers, had a little opening chat with tea and muffin. 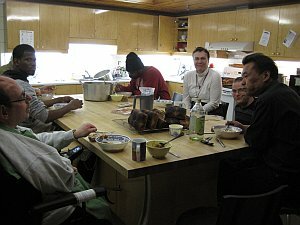 Today’s participants were all male, came from diverse cultures and age groups to make beef brisket stew and some bread. While we each started our tasks of chopping vegetables and forming bread, the oven was already hot. It had only been 2.5 hours! Sure, it’s a small oven (the baking chamber is very small for the size of the structure), but the size doesn’t necessarily reflect the time it takes to heat it up. This one heated up surprisingly fast. Conclusion first—the bread got burned. As a baking day, it was horrible. While the oven was very hot, the potato-onion dough was rising fast. I was afraid that it might deflate, but I should have waited at least for a while. And I burned the Healthy White Bread, too. I felt inadequate, but the day was fun. While I was running back and forth between the oven and kitchen (with help from participants), the stew was magically made. We had it with crispy smoky buns, and we talked about food from different cultures. The oven here is not too far from the kitchen, but it is far enough and invisible enough that it adds much more work to running the program. Krista and her colleagues are enthusiastic about the oven. They could always use a volunteer baker, if anyone is interested!